Are you welcomed by a nasty smell when you open your fridge? Unpleasant odors are the worst, especially when you’re getting ready to eat. Here are a few tips from our appliance experts on how to keep your fridge smelling fresh. The best way to eliminate odors is to prevent them from spreading in the first place. If your food isn’t properly contained, it may release odors that waft all over the surface of the fridge. 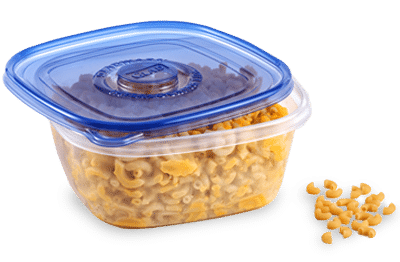 Make sure your food is secured properly in tupperware, a sealed plastic bag, or saran wrap. Bottles and jars should be shut firmly and any leaks should be cleaned as soon as possible. Once you have your food secured, you need to remember to throw out the bad food. Label leftovers with the date they were made. Thoroughly check your leftovers, dairy products, meats, and vegetables. These tend to go bad first and create horrible smells. Don’t forget to go through your condiments and other seldom-used items. If the odor persists after tossing your bad food, you may have odorous particles spread throughout the interior of your fridge. This means it’s time for a full cleaning. Remove all the contents and store in an appropriately cold receptacle (i.e. another fridge or cooler). Soak your racks and drawers in the kitchen sink filled with water and a cup of baking soda. 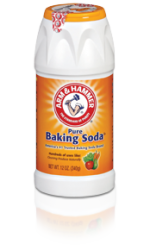 Use a baking soda & water solution to wipe down the surfaces of your refrigerator including the door seal. Don’t forget to clean the drip tray located on the outside bottom of your fridge. There are several common household items that are excellent for absorbing odors. These include baking soda, vinegar, oats, fresh dry coffee grounds, activated charcoal, and unscented chlorophyll cat litter. Simply leaving a bowl of oats or a glass of vinegar in an empty fridge for a few hours can make a dramatic impact. Make a habit of keeping an open box of baking soda in your fridge and replace it every three month or so (depending on how smelly your fridge gets). If you can downgrade the smell from a major to a minor odor, you may be able to cover up the remaining offending scent. Vanilla extract, lemon juice, and peppermint oil are three very pleasant smells that are natural and effective at covering over odors. They are all effective cleaning agents, so you can use them to wipe down your surfaces or soak a cotton ball and leave it in the fridge as an air freshener.